The Sydney Writers’ Festival sometimes feels like an election campaign because, just as political parties these days seem to deliver their policy launches a week or so out from the election, there already appears to be a month’s worth of Festival events stretching through May even though Mohsin Hamid is not due to deliver the Opening Address until 19 May. It is probably fitting then that an ex-Prime Minister kicked off events on May Day 2015. Linda Adair and Lucinda Adair-Roberts look back on Julia Gillard’s conversation with Jamila Rizvi. 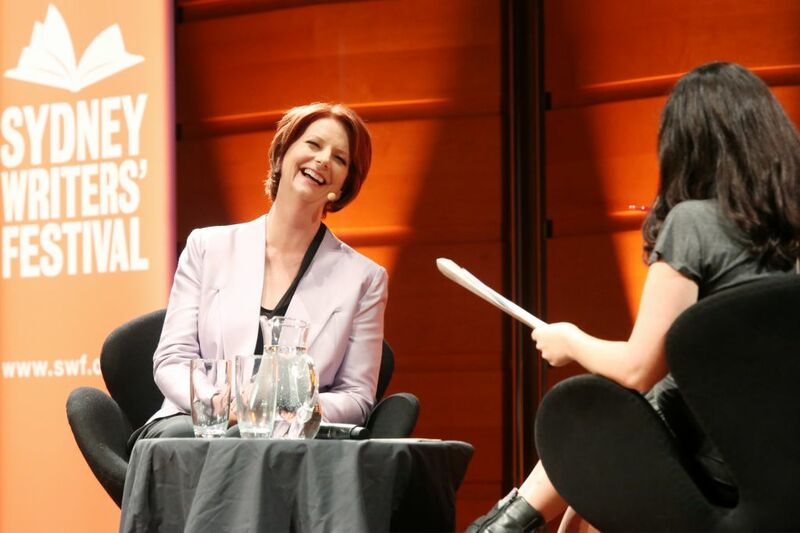 The wet weather and long cloakroom queue to check umbrellas could not dampen the enthusiasm of those assembling at the City Recital Hall Angel Place Sydney on Friday 1 May 2015 to hear Australia’s first female prime minister Julia Gillard converse with Jamila Rizvi. Editor in Chief of the Mamamia Women’s Network websites, on the theme of “Standing for Something”. Director of the 2015 Sydney Writers’ Festival, Jemma Birrell presided as MC to this sold out ‘premier event’, to ‘pre-launch’ the festival which runs Monday 18 to Sunday 24 May 2015. Through the conversational style that the interview took, and the scope for the audience to ask questions, one was left with a sense of knowing the author on a more personal and relaxed level. This appeared to stem from Gillard’s personal desire to show her more emotionally adept personality than she was unable to share with the public during her time as PM, due to the stigma associated with women in power showing too much emotion. We listened for one and half hours to her speak very genuinely on topics ranging from pop culture, to education, and gender, strength of purpose, ethics and the kind of world we want to shape. Without a tough and feisty interviewer in the style of Leigh Sales, Jamila guided a conversation among two friends with approximately 1000 “wannabe friends” appreciatively listening in. The audience clapped, and cheered and, at appropriate moments, laughed. Her keen sense of humour and incisive words cut through in a way that, with the exception of The Misogyny Speech on 9 October 2012, we rarely saw reported by the press. Julia’s cheeky reply was that whilst she enjoyed House of Cards, she felt that the idea that someone with Frank Underwood’s public profile could to go down to a station, unobserved, and throw a journalist under the train, no matter how attractive the idea might be, was rather implausible! She said that The Hollow Men was fun but extreme, which meant that the West Wing, in the romantic Bartlett era, while portrayed by “impossibly good looking people”, best captured the sense of purpose that, for Julia’s money, should drive people to enter politics. She cited the character CJ’s work for Emily’s List prior to joining Jed Bartlett’s staff as an example, noting that Emily’s List is a real foundation which Labor supports in this country. 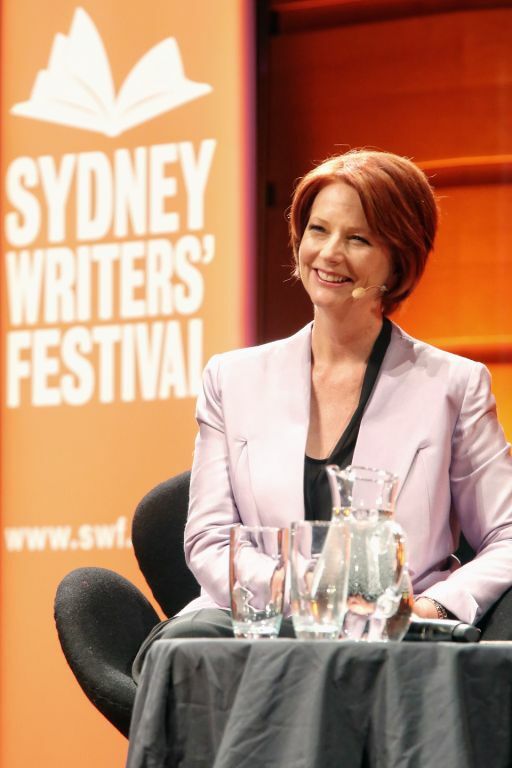 Whilst the three years and three days of Julia Gillard’s Prime Ministership was the locus of the conversation, it comprised a cool listing of achievements and at times a, refreshingly humble, critical self-awareness of political missteps such as the “real Julia” which she described as a “clumsy lunge at the reset button” in the face of the two contending narratives put forward by the media about Labor’s 2010 election campaign. Illogically, her government’s election campaign was simultaneously criticised by the media as being “too tightly scripted” and “out of control”. Although the “F word” – Feminism – was not uttered by Julia until it came up in questions from the floor, it was implicit as when she said, as is foregrounded in My Story, that she was always aware that if she showed emotion in the role of the first female prime minister, she would labelled “psychologically fragile” and the threat was that all women in future would be left with that stigma. She declares in the first page of the book that even after losing the prime ministership “I was not going to let anyone conclude that a woman could not take it”. The definition of Feminism she prefers is one where roles are not constrained according to stereotypical norms for either gender, because if women benefit from wider choices as to the paths they can follow, so do men. Her contention being that, given merit is based equally among the sexes, until there is equality of representation, with equal numbers of men and women in senior roles at all levels of society, we are selling our country short because, necessarily, we do not have the best people in important roles. During the conversation Julia referred to the dichotomy of archetypes highlighted in 1975 by Anne Summer’s Damned Whores and God’s Police and how, in the media to this day, male leadership collocates with likeable whereas the same qualities for women will be recast as unlikeable; possibly because women leaders are in the minority. Gillard’s observation that with the same characteristics in a leader being interpreted through the prism of gender and gender stereotypes, there is an oppositional relation of a Likeable Male Leader to an Unlikeable Female Leader. This says much about the culture we live in and flags a debate that needs to be had. Binary classification necessarily privileges the first “A” term at the expense of the second, “not A”, term which is characterised as the absence of, or “Other” to, the characteristics of the first term. This is central to the phallocentric logic that has sustained patriarchal institutions since Plato. As a contemporary to Julia, and the first person in a family to finish school and attend university, one of the co-authors of this piece stands in respectful awe of her achievement and applauds the resilience that allowed her to do extraordinary things in spite of formidable obstacles. The other co-author is of the generation that seeks to redress the imbalances. Together, we lament that Julia had to gain this awareness the hard way; empirically. Doubtless as she was working in a domain where women were the minority, with a work load so enormous, on issues so big that by comparison theoretical awareness seemed irrelevant, we consider such analysis and strategy is key to what positive change demands. Whereas Arts undergraduates studying feminist theory would likely be familiar with the structuralist critique discussed above, vocationally specific degrees such as law may not provide the chance for reading feminist theory and, as we know many parliamentarians have cut their teeth working in law. Volumes of theoretical analysis have interrogated the supposedly value-free, common-sense view of the world that privileges male identity and normalises it, but applying theory to developing some enabling practical strategies for the future would prevent a repeat of the negative labelling that hounded Julia Gillard’s tenure. It is a project for progressive men and women be they academics, parliamentarians, activists or simply fellow travellers to engage in, before our next female prime minister is elected only to face the same battles. As the experience of our first female prime minister attests, it is through practice that things do change. However, best practice would be informed by theory and full of reflection and advice to educate and protect the next generation of women who willl strive to find a path to change the world so that they also look after their own wellbeing. Resilience of the sort that Juliaso doggedly demonstrated, needs to be more than a personal characteristic; it needs to be something that is embedded into the strategy and practices of feminist politics. Thus, devising, evaluating and creating an alternative paradigm for what goes by the label of political leadership is the other legacy of Julia Gillard’s prime ministership. Whilst she continues to work to make the world a better place, through her global and teaching roles, Julia has graciously left the political stage for those who follow in her wake. However, her book and this wonderful conversation provide valuable foundations for those seeking to build a framework for the next generation of politically engaged women, forewarning them of some of the pitfalls awaiting them public life, to stand for something positive for those without representation and lacking choices. Linda Adair is a Sydney based critic and an editor of Rochford Street Review.